This secluded cabin is everything you would imagine in a perfect mountain creekside getaway. Relax in your HOT TUB as you look at the stars and listen to the rushing mountain stream surrounded by beautiful Mountain Laurel, Rhododendron. This cabin is perfect for your large group, family reunion, kids, pets, or romantic couples getaway. It is situated on 3 very private acreas with plenty of roaming around room outside along the creek. Relax in the comfortable rockers or dine out on the spacious vaulted cedar screened in porch directly facing the creek and mountain. There is a newly added comfortable queen futon for creekfront sleeping on the screened porch! The favorite sleeping accommodations in the place! The cabin has the largest square footage of any of the rentals in the area with 3 nice size bedrooms + queen loft including a HUGE master bedroom, bath and closet right on the creek, and an extremely spacious open kitchen to the dining room and living room. Perfect space for where everyone seems to gather! Pan for gold in this old gold mining mountain stream running through the property. No one has yet to be skunked! You can fish from the stocked pond up the hill in the neighborhood. Hiking trails galore nearby with 4 huge gorgeous waterfalls, the Cherahala Skyway in your backyard, all within a few miles. Directions, maps and hiking recommendations provided in the cabin. 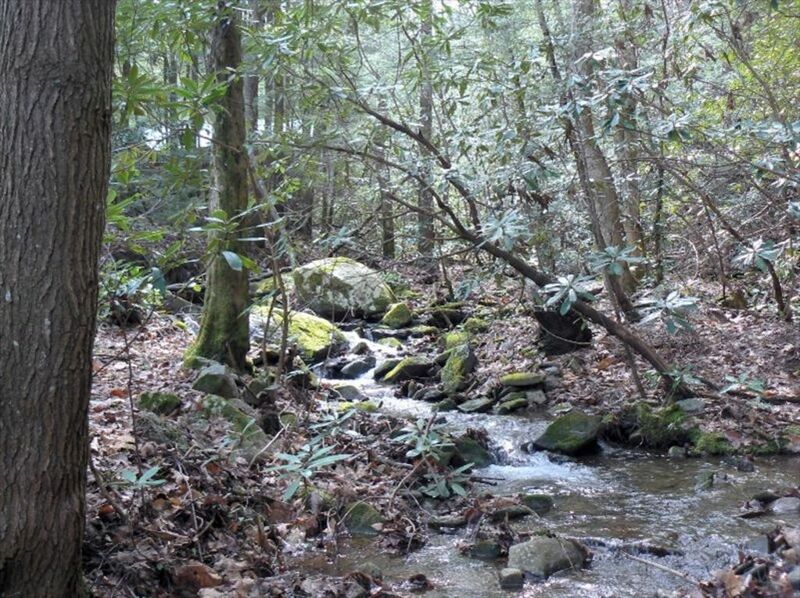 You won't find a more secluded, spacious, creekside mountain paradise as this one in this entire area. Repeat customers are now the regulars. Come and find out what the lucky people are enjoying, this very special cabin and natural wonderland surrounding it. I bought this cabin originally because I fell in love with the Tellico Plains area. I couldn't believe how gorgeous and yet undiscovered this part of the country is. This is a very unique and special place. I love to share the secret, but also, don't want it to change the way it is now. If you like places that are still untouched, back in time, and a nature lovers dream, this is it. When I saw the setting this cabin sits on, I didn't look any further. The privacy, the sounds of the rushing creek, the beauty of sitting on the screened in porch watching the small waterfalls running along the creekside in front of you day or lit up at night, is absolutely magical. Sleeping to it, THE BEST. Ocoee River and Tellico Rivers near by. Hottub located outside on its own deck with creek views off of a huge cedar screened in porch with vaulted ceilings directly facing the creek and mountain with plenty of dining and comfortable seating areas. The creek and mountain are all lit up at night making it a beautiful place to enjoy the evenings. This was an excellent cabin and location. So peaceful! Loved the back porch overlooking the creek. This was more than we could have asked for; the pictures do not do it justice. Highly recommend! Fun for the eclipse for sure! Wow the place is actually a lot nicer than the pictures let on. Good wifi, no phone service and the kitchen had more than enough tools, plates and silverware for our group of 16! Easy to get to for cars, it's not far off 68 at all! The back porch bed is for sure the one to fight over! The beds are quite comfortable, and the place was very clean. I highly recommend it! The cabin was great. It was very quiet and peaceful Screened in porch was awesome ! Nice place and not to far out of town. It's very peaceful. The roads around there are great for motorcycles. I would definitely recommend the cabin and the area for a peaceful vacation. If your looking for a beautiful place to have a great family vacation you will love this cabin. Plenty of room and beautiful. The screen porch is amazing, spent my mornings and my evenings just relaxing and enjoying. The falls in nearby areas are beautiful and my girls (12 and 15), husband and I enjoyed the scenery on the way there. We spent a lot of time at the cabin, nature scavenger hunts, panning for gold (even found a few small pieces), and just being together. You will love it. Quiet and Remote! Just what we wanted. Enjoyed 5 days with extended family at cabin. Close enough to horseback riding and whitewater rafting that the kids were happy. Quiet and peaceful enough for adults to have wine on the beautiful screened porch! Cabin was well stocked. Will definitely be on return list! This place is completely a nature lovers paradise. If you like to fish, there is a stocked pond right in the neighborhood where you can catch and release large trout. The most amazing waterfalls are all within a few miles of the cabin and directions to each are provided at the cabin along with hiking maps. This place is very secluded yet close to all the nature adventure you could imagine right from your doorstep. If you haven't discovered the Tellico area, you have a sight to see!! !